Along with practical perks like free Wi-Fi pleasant diversions â?? from on-site dining to indoor swimming â?? 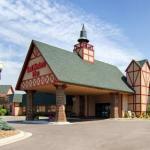 help make for a holiday experience at the non-smoking Best Western Plus New Ulm. The 126 rooms at this two-story Best Western Plus take tasteful classic design and kick it up a notch with vivid color accents. Slipping into their triple-sheeted beds guests can prop up their laptops fire up free Wi-Fi and flip through choice channels including HBO on their flat-panel TVs. Thanks to an on-site bar and grill open for breakfast lunch and dinner guests don't have to go hungry for long. Those looking to score have a game room with billiards and a slew of video games. After powering through a full workout in the fitness room guests can chill out in the indoor heated pool and hot tub. Pets are allowed. Ample outdoor parking is provided. Right on Minnesota State Highway 68/Highway 15 for fast-track convenience the Best Western Plus makes it easy to slip away to the area's prime green scene with Flandrau State Park's trails and the New Ulm Country Club's fairways within three miles. Business guests are on track with Kraft Foods less than a half-mile and AMPI Butter Plant and 3M within three miles. Minneapolis-St. Paul International Airport is just over 90 miles from the hotel.